These kebabs are quick and easy to make, using a selection of prepared ingredients. They are ideal for the barbecue or for grilling. Light the barbecue 45 minutes before cooking. The flames should have died down and the coals be glowing under a layer of ash. Or, just before cooking, light a gas barbecue or preheat the grill to high. Thread eight metal or wooden skewers alternately with the turkey cubes, pineapple pieces and red pepper. Lay the kebabs in a single layer in a shallow roasting tin. Mix together the stir-fry sauce with the coconut cream and the pineapple juice. Drizzle about 2 tbsp over each kebab then roll them until evenly coated. Cover and chill until ready to cook. Place the remaining sauce mixture in a small pan and bring to the boil. Bubble for 4-5 minutes or until it is reduced by half and is the consistency of thick cream. Stir in the chopped coriander. Grill or barbecue the kebabs for about 10 minutes, turning often until golden brown and beginning to char at the edges. The turkey should be thoroughly cooked with no pink meat and the juices should run clear. Place on a plate, drizzle with the hot satay sauce, garnish with the shredded basil and serve with Waitrose Nantaise Salad and Eastern Inspirations Fresh To Wok Egg Noodles. The kebabs can be threaded the day before, drizzled with the sauce and kept covered in the fridge. Heat the remaining sauce as above in step 4 when ready to cook. 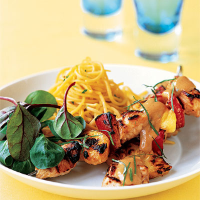 The satay sauce can be served hot or cold, and is also excellent with barbecued prawns. Wash hands, equipment and work surfaces thoroughly after handling raw meat.